A vehicle rammed through the Isla Blanca Park toll booth just before midnight yesterday. The collision collapsed the canopy over the toll booth, but park officials say a temporary fix is in place and the park is open. 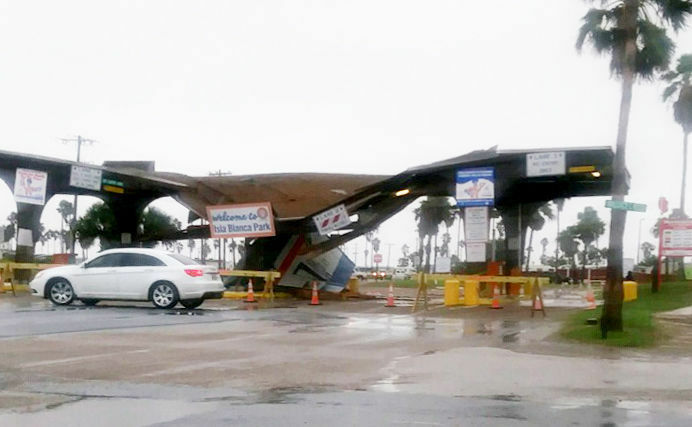 HARLINGEN — An out-of-control vehicle smashed into the Isla Blanca Park toll booth just before midnight Thursday, destroying the booth and collapsing the roof canopy. No injuries were reported, county officials said. County Parks Director Joe E. Vega said the park remains open despite the damage which occurred at 11:30 p.m.
Isla Blanca Park is the county’s most popular park, and serves as the crown jewel of the park system. Located on the southernmost tip of South Padre Island, the park offers a mile of sandy gulf beach as well as beachfront pavilions, food and beach rental concessions, over 600 full hook-up RV sites and a boat ramp.